LOOK FOR SPECIALLY MARKED EVOLAB BOXES FOR A CHANCE TO WIN (2) VIP TICKETS TO 420 ON THE ROCKS OR A Free Grape Dreams T-Shirt. When you purchase an Evolab Colors, Chroma or Alchemy cartridge, look for a peel and reveal sticker on the outside of the packaging for a chance to win (2) VIP tickets to this year’s “420 On The Rocks featuring Stick Figure” or a limited edition Grape Dreams t-shirt designed by local artist Tyler Spangler. Lucky VIP ticket winners will also find a Golden Bracelet inside their packaging with a unique code and number. Winning stickers can be redeemed below. VIP Ticket Winners must redeem their Golden Bracelet by 12pm on Friday, April 19th. For questions, please reach out to 420@evolab.com. Please choose your size. T-shirt winners must take a photo of their sticker and present upon request. Ship date for t-shirts begins around 4/17/19. While supplies last. Ship date for t-shirts begins around 4/17/19. While supplies last. Can’t find a retailer with specially marked Evolab boxes? Click the button below. *Must be 21+ to participate. Restrictions apply. Inventory may vary by store location. T-shirt winners must take a photo of their sticker and present upon request. VIP ticket winners must provide the unique code and ticket number during the redemption process, and they need to hold onto their Golden Bracelet to receive extra prizes from our team at Red Rocks. VIP Ticket Winners must redeem their Golden Bracelet by 12pm on Friday, April 19th. Ship date for t-shirts begins on 4/17/19. While supplies last. 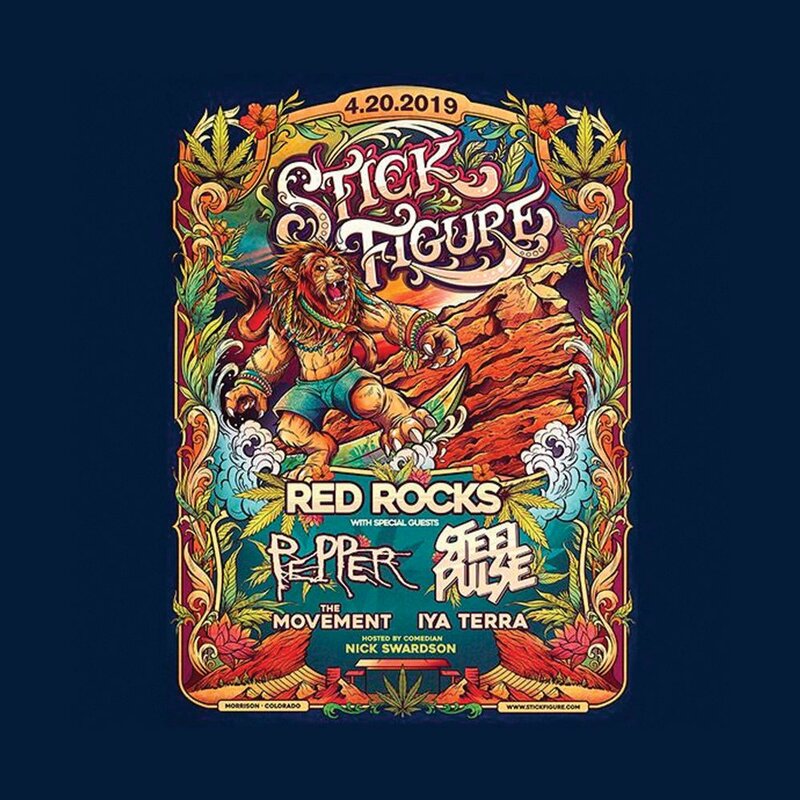 VIP tickets will be picked up by winner at Red Rocks Will Call under their name. A one OF A KIND flavor for a ONE OF A KIND NIGHT. Flash your Grape Dreams LED bracelet when you visit a LivWell or Buddy Boy recreational location until 5/20/2019 to get a new Colors Grape Dreams All-In-One vape for only a dollar. Click the button below for a list of LivWell and Buddy Boy locations. WE'RE PROUD TO SPONSOR 420 ON THE ROCKS WITH OUR FRIENDS AT LIVWELL. 420 is one of the biggest celebrations of the year. What better way to ring in another year of legalization than being around friends and listening to great music at one of the best venues in the world. This year, as presenting sponsors for 420 On The Rocks, we wanted to celebrate right by your side. This event starts off the Red Rocks concert season by providing two nights (4/19 & 4/20) of jam packed music and special guests. Designed and illustrated especially for Grape Dreams and 420 On The Rocks by artist Tyler Spangler. Tyler’s work has illuminated our Colors products since their inception. He focuses on the formalist relationship between images removed from their original context and explores the connotations of color, form and photography through digital collage. His designs are colorful and unabashedly chaotic. He has a BA in Psychology and is an Art Center College of Design dropout. He ran an illegal punk venue for 13 shows until it got shut down by police. Check out his work below.